Sherbert Dandies - mounted by Sarah Jane Szikora // £235.00. 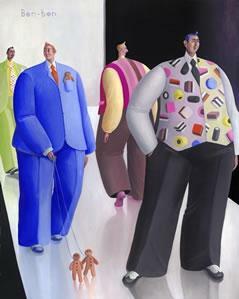 This piece by Sarah Jane Szikora shows several gentlemen on a cat walk wearing very bright and sweety oriented clothing. One even has gingerbread men as pets too!